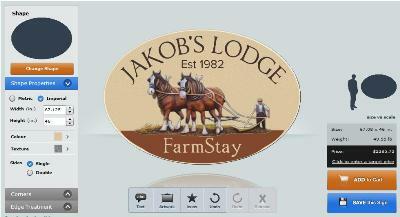 Custom Sign Designs - Require a Fee. Our clients have always valued the skills of our award winning designers and have paid us a reasonable fee for any custom design work they may have needed in the creation of signage. This approach works well for larger projects. Some designs require formal proposals and commitee approvals. But not everyone wants to pay a professional to design a simple small house sign for them. Some people know what they want, they just need a good way to visually communicate their concept! In 2008, using simple but classic design elements, we created the worlds first interactive 'design-your-own-sign' website. This approach allowed home owners to create their own sign designs. We waived the extra design fee and clients placed orders online. This tool was great - but limited to small signs. 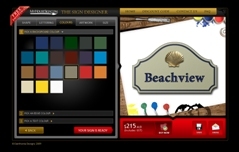 The popularity of the My-House-Sign site encouraged us to develop a more sophisticated interactive site to meet a wider range of signage needs. This new tool empowers you to create, revise, email and finalize your own designs - without paying for a designer! 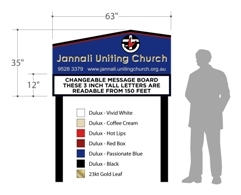 Danthonia's sign-designer tools allow you to design large handcrafted farm signs, business signs, church signs, pub signs, school signs or whatever other signs you may need. Much care has gone into the creation and selection of the classic shapes, color schemes and font combinations. People with little or no sign design experience can use the tools on this site to assemble professional looking sign designs from a small house sign up to something 4ft x 10ft in size. Pay for the sign only - not the design!